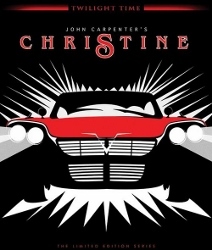 Horror writer Stephen King’s novel Christine is a creepy tale of a car inhabited by an evil spirit, who wreaks havoc on anyone who crosses its path. I have to admit, the book creeped me out to the point of losing sleep when I read it as a teenager. There was something about the way the car got inside its owner, Archie’s, head that chilled me. The 1983 film, directed by John Carpenter, based on King’s book does not capture all that creepiness, but it does manage to be entertaining in a more generic horror kind of way. The strength of the film (recently issued as a limited edition Blu-ray, already sold out, by Twilight Time) lies in the lead performance of Keith Gordon, who does an excellent job portraying Archie’s transition from high school loser to suave ladies’ man. The film dispenses with most of the character development depicted in the novel. If there is one thing I love about King’s writing it’s the way he creates characters that seem as real as your next door neighbor. He then throws those people into bizarre situations, but it all stays relatable because the characters seem familiar. However, translating King’s books to film is not always so easy. Films based on his books are hit and miss, I think, because it’s hard to capture the essence of his stories on film. In this case, the film loses some of the uniqueness of the book. Instead of a car intertwined with the evil aura of its owner, it’s just a killer car. The opening scenes shows that Christine was evil before she even left the assembly line. When teenage Arnie buys her, she’s a dilapidated, rusty heap of junk that hardly seems worth the $250 he pays. His best friend Dennis (John Stockwell) tries to talk him out of the purchase, but Arnie is determined to restore the car to her former glory. For this, Christine falls in “love” with Arnie, and she won’t let anyone get between them. Not Dennis, Arnie’s girlfriend Leigh (Alexandra Paul), or the school bully Buddy (William Ostrander). Christine protects Arnie, and in the meantime Arnie begins to take on the characteristics of the cars previous owner, who was not the nicest guy in the world. Unlike the novel, we never meet the previous owner. We only see his elderly brother, who provides a grisly backstory about his now deceased brother and the car. 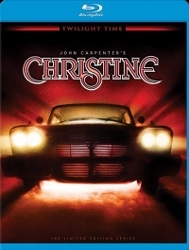 Ultimately Christine is not all that scary, it’s short on tension and any real jumps. What’s best about it is watching the transformation of Arnie as he becomes obsessed with his car. The story is almost too straightforward. The car is evil therefore the car must be stopped. The little twist at the end works, but there is not enough build up to it to make it as spectacular as it should have been. Instead Christine is just an easy-to-watch genre piece that’s entertaining enough, but doesn’t leave an impact. As I mentioned, Twilight Time’s Blu-ray edition is limited to 3,000 copies, all of which have been sold out. The 1080p, AVC-encoded transfer is great, allowing Christine to look like a 1983 movie (in terms of grain and color saturation) but as cleanly as possible. The DTS-HD MA 5.1 soundtrack is also strong. There’s not a huge amount of activity in the rear channels, but the dialogue is crystal clear. One new extra has been added to the various ones carried over from an older DVD release. John Carpenter’s subtle score is offered as an isolated track in DTS-HD 2.0. There’s an audio commentary with Carpenter and actor Keith Gordon, 26 minutes of deleted scenes, and three making-of featurettes totaling about 48 minutes.